Quantity Discount! Purchase your Real Theater coconut popping oil in case quantities and save $1.00 per jar. 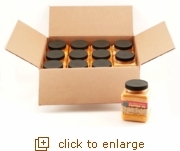 Case quantity includes 12 jars, 16 oz. each. Real Theater Coconut Popping Oil is essential for making theater or concession style popcorn! When you use this premium popping oil, you’ll know that each amazing batch of popcorn that tastes like it's fresh from the theater or ball park! Makes approximately 17 batches when used with Whirley Pop (amount will vary with commercial popper or depending on your personal oil preferences). Coconut oil is a key ingredient for premium popcorn taste (like the ball park or movies).